Advances in technology and increasing understanding of fetal development, it is now possible to assess fetal anatomy in the first trimester in some pregnancies. In recent years prenatal screening and testing have begun to shift from the second-trimester to the first-trimester. Ultrasonographic evaluation – a large component of fetal testing – is also applied earlier in gestation to provide information to clinicians and patients about the integrity of the pregnancy. 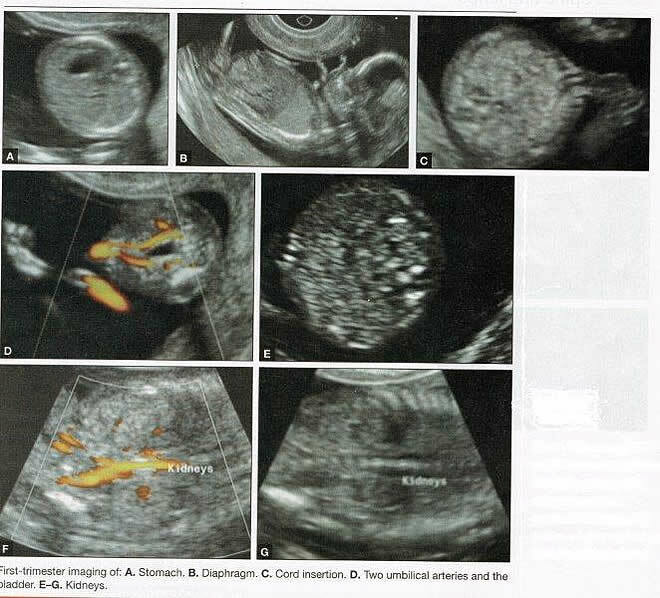 The sifting of the classic, “gold standard” anatomy scan to the first trimester was made possible by high-frequency transvaginal transducers and by greater understanding of the early signs of fetal pathology. Maternal serum screening for neural tube defects and fetal aneuploidy in the second trimester has been incorporated into obstetrical practice over the past two decades. Now, as a result of several multicenter trials, first trimester screening between 11 and 14 weeks has been shown to be an effective and reliable screening test for Down syndrome and trisomy 18. Benefits of first trimester screening include earlier identification of the pregnancy diagnosis by chorionic villus sampling (CVS), if available. The purpose of this document is to discuss evolving applications of first-trimester ultrasound. Scanning can be performed transvaginally or transabdominally, although the transvaginal route is preferred during the first-trimester, because of high-resolution images it yields. Clear images improve reliability and accuracy. However, at times, a combination of transvaginal and transabdominal scanning may be preferred. 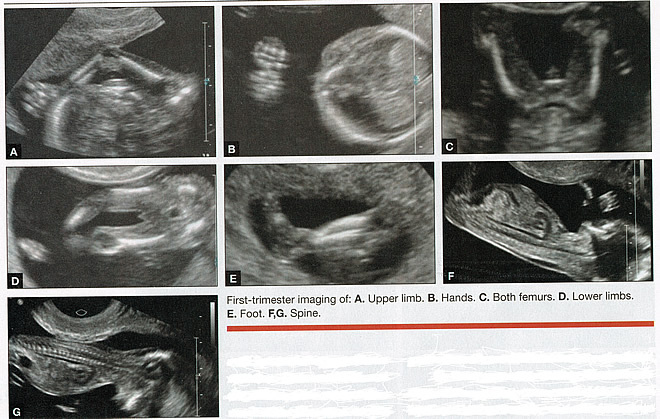 Both basic and advanced first-trimester ultrasound applications are discussed in this review. It can include a detailed fetal anatomy scan, if desired. First-trimester ultrasound can help determine the source of any first-trimester vaginal bleeding, differentiating between threatened abortion, early fetal demise, and ectopic pregnancy. It also can help confirm the pregnancy location, revealing whether it is a definitive intrauterine or definitive ectopic gestation, although first-trimester ultrasound can also be inconclusive in this application. An inconclusive scan in the presence of a positive pregnancy test is known as a “pregnancy of unknown location” (1). Along with first-trimester ultrasound, serial measurement of serum human chorionic gonadotropin (HCG) is used to arrive at a diagnosis. Two under-reported complications in women who have undergone cesarean delivery are cesarean-scar pregnancy and early placenta accreta (2). As the rate of cesarean delivery has increased, so have these two serious complications. Successful treatment depends on their identification at the earliest possible time. Early diagnosis is feasible – even before the time of first-trimester screening – if the sonographer focuses on the lower uterine segment (3). High-frequency transvaginal probes allow earlier and more accurate diagnosis of embryonic and fetal viability, even in the first trimester, through the assessment of cardiac activity. In addition, early pregnancies can be dated accurately by sequential sonographic visualization of the gestational sac, yolk sac, embryonic pole, cardiac activity, and amniotic sac. Measurement of fetal crown-rump length (CRL) also provides landmark information that aids in dating the pregnancy and managing different aspects of the gestation. Combined data comparing menstrual cycle with mean gestational sac diameter, crown-rump length, and HCG levels. The first trimester is also the best time to identify, date, and evaluate multi-fetal gestation in regard to chorionicity and amniocity. These variables, which are important in determining optimal management and potential outcomes, are more difficult to determine later in pregnancy. Once viability is confirmed, first-trimester ultrasound and biochemical testing can be used for aneuploidy screening between 11 and 13-6/7 postmenstrual weeks. Sonographic measurement of the anechoic space between the skin and the edge of the soft tissue that overlies the cervical spine – otherwise known as nuchal translucency (NT) – is used to determine the likelihood that the fetus is aneuploidy. NT measurement alone has sensitivity of 64% to 70% for the detection of trisomy 21, as well as a false-positive rate of 5%. When NT assessment is combined with the measurement of maternal serum pregnancy-associated plasma protein A and free serum HCG, sensitivity increases to 82% to 87% (4). When maternal age is factored into the equation, sensitivity may exceed 90% (5). Assessment of the nasal bones, ductus venous flow, tricuspid regurgitation, and hepatic artery flow in combination with NT measurement can also improve sensitivity in the detection of trisomy 21 (5). 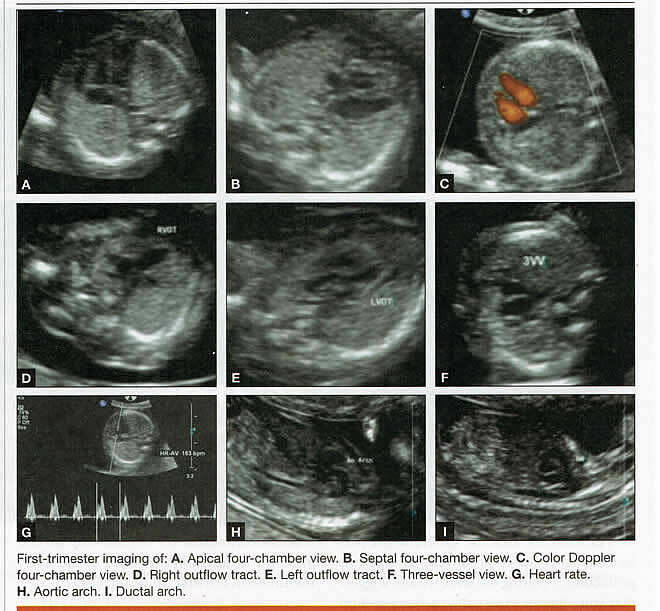 At the time of NT assessment, first-trimester ultrasound can be broadened to evaluate the age-related anatomy of fetal organs systems. At 12 post-menstrual weeks, approximately 40% to 50% of common, ultrasonographically discernible anomalies are already present (6). The American Institute of Ultrasound in Medicine (AIUM) recommends that “embryonic/fetal anatomy appropriate for the first trimester should be assessed” during the first trimester (7). Although AIUM provides no details about the list of structures to be evaluated, it does provide a guideline for the second-trimester anatomy scan that can be adapted easily for use in the first trimester. Head, face and neck: cerebellum, choroid plexus, cisterns magna, lateral cerebral ventricles, midline falx, cavum septi pellucid, upper lip and nuchal fold. Chest: 4-chamber view, outflow tracts, if feasible. Abdomen: stomach – presence, size and situs, kidneys, bladder, umbilical cord insertion site (into fetal abdomen), umbilical cord vessel number. Spine: cervical, thoracic, lumbar, and sacral. Extremities: legs and arms – presence or absence. Fetal anomalies can be assessed during the first trimester, and it is described below. It is also important to evaluate the cervix in the first trimester, keeping the risk of preterm delivery in mind, as well as the maternal uterus and adnexae – looking for pathology and the placenta – its position and abnormalities. Cervical-length measurement using transvaginal sonography (TVS) is an essential part of assessing the risk of preterm delivery. At mid-gestation, it provides a useful method with which to predict the likelihood of subsequent preterm birth in asymptomatic women. In women who present with threatened spontaneous preterm labor, TVS measurement of cervical length can help to distinguish between ‘true’ and ‘false’ spontaneous preterm labor. Additionally, there is some evidence that measurement of the cervix at the 11+0 to 13+6-week scan can help to establish the risk of preterm birth (10). The cranial bones should be visible at the time of first-trimester ultrasound. Their absence – acrania, which leads to anencephaly – can be diagnosed even before 12 weeks’ gestation. At 11 to 14 post-menstrual weeks, the ultrasound image of the brain is dominated by the two relatively prominent lateral ventricles, which are filled with the choroid plexuses. In this age range, the cortical mantle appears to be relatively thin, which is normal. The two hemispheres of the brain should be symmetrical in size, divided by the important midline falx. Ventriculomegaly can be diagnosed relatively early if the choroid plexuses do not fill the ventricles. 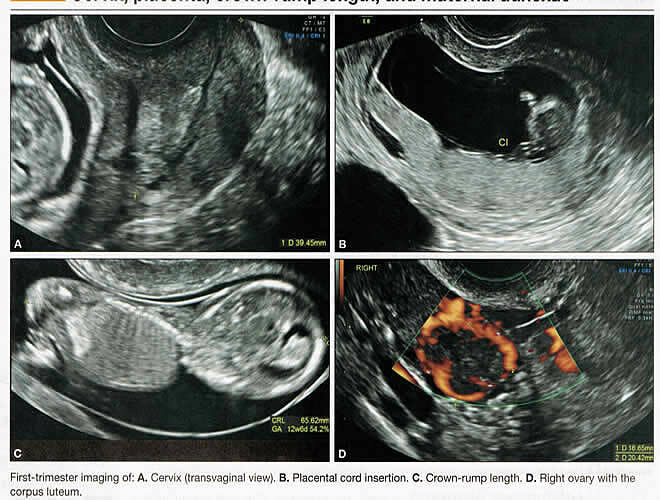 Significant ventriculomegaly identified during the first trimester is an ominous sign, usually pointing to a poor outcome, but should be confirmed in later scans. Figure 3. First trimester imaging of: A. Upper lip; B. Cerebellum; C. Falx and symmetry; D. Profile of the face; E. Lens and orbits; F. Choroid plexus. Holoprosencephaly, which presents with clear communication between frontal horns or the entire ventricles, is without a doubt one of the earliest detectable brain pathologies (along with anencephaly). In recent publications, researchers have introduced the intracranial translucency (ICT) for early diagnosis of spina bifida (8). More large-scale research is needed to determine the sensitivity and specificity of this finding before it can be recommended for routine clinical use. Other neuro-anatomic structures, such as the posterior fossa with cerebellar hemispheres, and cistern magna, the corpus callosum, and the cava (cavum septi pellucid and Vergae) complete development later; they are better evaluated in the second trimester. However, early observation of a grossly dilated cistern magna or a large anechoic midline structure should be followed up in a more detailed, later scan. The corpus callosum (CC) is the largest commissural pathway connecting the two cerebral hemispheres. It develops relatively late during cerebral ontogenesis, not assuming its definitive shape until 20 weeks of gestation, and continues to grow well after delivery. Therefore, a proper prenatal sonographic evaluation can be performed only after 20 weeks. Ideally, the CC is assessed on ultrasound by direct visualization. It is a thin band of white-matter fibers and is not depicted using a standard axial plane. It can be seen in the coronal plane, but is only demonstrated in its entire length by using mid-sagittal views, that represent the gold standard for diagnosing abnormalities of this structure. Visualization of coronal and mid-sagittal planes requires technical skill, and is not recommended in standard examinations of low-risk pregnant patients. Reference ranges of fetal CC dimensions have been published and can be used to assess normal and deviant development. There is a general consensus that diagnosing CC abnormalities is difficult. In standard examinations, absence of the CC may be detected because of either indirect cerebral findings, such as ventriculomegaly, absence of the cavum septi pellucidi or widening of the interhemispheric fissure, or associated extracranial findings. The sensitivity of screening exams is, however, unknown, but is probably limited (11). First-trimester sonographic diagnosis of cephalocele is accomplished easily with a detailed examination of the skull contour at the time of routine assessment of the axial and sagittal views of the head for measurement of the biparietal diameter and nuchal translucency, respectively. However, the sonographic features are highly variable. A significant proportion of cases are associated with genetic or disruptive syndromes. Prenatal diagnosis of cephalocele in the first trimester was associated with a high rate of termination of pregnancy and early intrauterine fetal demise. Only one fetus in this series survived and is neurologically intact; therefore, the prognosis of this condition remains poor (12). The neck and nasal bone can be evaluated to help determine the risk for aneuploidy, with special attention focused on the nuchal area of the fetus. Measure the NT in perfect median plane, according to rigorous protocols (9). During the scan, we also suggest that you attempt to visualize a cross section of the neck. The detection of septations may change the diagnosis from a thick NT to septated cystic hygroma colli. The face, profile, orbits, and lenses are also visible in the first trimester, and anomalies such as micrognathia, cleft lip and palate, and anomalies of the profile have been reported, among others (6). The big breakthrough in first-trimester ultrasound screening was the advent of NT measurement. Between 11 and 14 weeks, a clearly demarcated fluid-filled space can be seen behind the fetal neck. This space is present in all fetuses. An increased NT measurement is significantly associated with fetal Down syndrome and other aneuploidies. The detection rate for Down syndrome is approximately 70% with a 5% false-positive rate. Other sonographic findings are being investigated as potential markers for Down syndrome. Absence of the nasal bone is associated with Down syndrome but its value as a screening test in general population is controversial. As with the NT measurement, standardization of the technique and quality assessment programs are essential (13). Some programs have incorporated nasal bone assessment into their first trimester screening protocol (14). Now there is also substantial evidence that congenital heart defects may present with increased NT measurement (15). Other findings associated with increased NT measurements include diaphragmatic hernias, skeletal dysplasias, and a variety of genetic syndromes (15). Based on the current evidence, the American College of Obstetricians and Gynecologists (ACOG) recommends that patients with a fetal NT measurement of 3.5 mm or higher be offered a targeted ultrasound, echocardiogram, or both. The thorax, the integrity of the diaphragm and several basic features of cardiac anatomy can be evaluated during the first trimester, including cardiac position, the four chamber view, and outflow tracts. With minimal added effort, the aortic and ductal arches can be added to this list. Multiple investigations have concluded that an experienced sonographer can identify congenital heart disease with reasonable accuracy during the first trimester. However, these investigators also recommend a second-trimester ultrasound to follow up on the anatomy or any abnormalities of the heart identified in the first trimester (16). Figure 4. 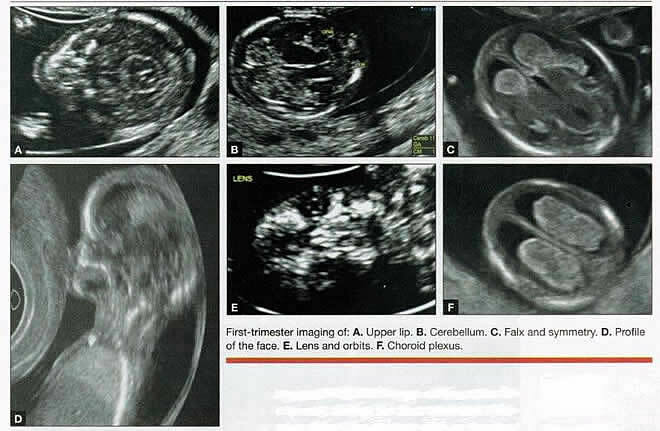 First trimester imaging of: A. Apical four-chamber view; B. Septal four-chamber view; C. Color Doppler four-chamber view; D. Right outflow tract; E. Left outflow tract; F. Three-vessel view; G. Heart rate; H. Aortic arch; I. Ductal arch. The presence or absence and location of the anechoic stomach and bladder should be determined in the first trimester. By observing the heart axis and location of the stomach on the left side, normal situs solitus can be confirmed. The bladder is the second hypoechoic structure in the abdomen and should be visualized easily. Its absence or enlargement may be a sign of other congenital anomalies. The slightly hyperechoic appearance of the normal kidneys should be documented, along with their tiny, anechoic renal pelvises. The renal arteries can be visualized easily via color Doppler (used as briefly as possible). If they cannot be detected, consider possible agenesis of one or both kidneys. Renal dysplasia, renal parenchyma that has been replaced by multiple cysts, and ectopic kidneys can also be identified in the first trimester. Look for umbilical cord insertion into the abdomen only after 12 post-menstrual weeks because the physiologic umbilical hernia is still present before that age. You can observe the coursing of the two umbilical arteries on either side of the bladder to determine the umbilical cord vessel number using color or power Doppler (again, as briefly as possible). Although fetal gender may be determined in the first trimester, it may not be accurate before 12 weeks, when it can be based on the angle of the genital tubercle (17). Any first-trimester ultrasound assessment of fetal anatomy should include visualization of the extremities. Ample amniotic fluid and active fetal movements facilitate this examination. Be sure to document the presence or absence of long bones in the upper and lower extremities, as there have been numerous reports of anomalies affecting these structures in the first trimester. Limb abnormalities and isolated deformities (e.g. club foot) – not to mention the absence of a limb segment – can be observed and evaluated in the first trimester. Even the relatively small hands and phalanges can be assessed if pathology is suspected (18). Evaluate the spine using a median, longitudinal, and serial transverse section to confirm integrity. Also attempt to access the overlying skin by visualizing the area when the fetus moves away from the uterine wall. A combination of transvaginal and transabdominal scanning techniques may be necessary to generate a quality image of the spine in the median plane. As mentioned earlier, the intracranial translucency may be utilized in the future as a tool to screen for neural tube defects. It is even more important to focus on the spine in patients who have a history of spina bifida. Placenta accreta is associated with considerable maternal and fetal morbidity and even mortality. Maternal complications are primarily the result of massive hemorrhage. Indeed, many cases are associated with “audible hemorrhage”. In turn this leads to disseminated intravascular coagulation, multi-organ failure, and the need for additional surgery including hysterectomy, thromboembolism, and even death. The mainstay of antenatal diagnosis is obstetric ultrasonography. In some cases diagnosis is possible in first trimester. Abnormalities include a cesarean scar ectopic pregnancy or gestational sac that is implanted in the lower uterine segment (see figure below). Irregular vascular spaces within the placental bed and loss of retroplacental-myometrial zone have also been reported (21). Implantation of the gestational sac imbedded into the uterine window at the site of the prior cesarean delivery (“cesarean scar ectopic”). Figure 7. Cesarean delivery scar from ectopic pregnancy in first-trimester ultrasonogram; if untreated, this often progresses to placenta accreta. 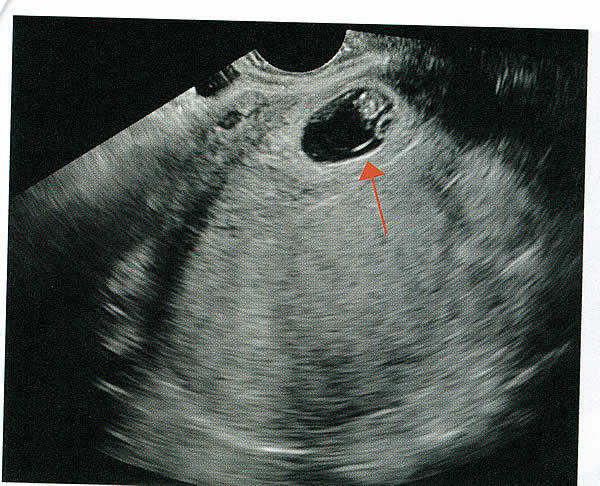 Arrow shows gestational sac in the cesarean delivery scar, outside and superior to the uterine cavity. Recent data on an experimental application of first-trimester ultrasound suggest that it may be used one day to evaluate uterine artery Doppler velocity wave forms as a way or predicting preeclampsia and intrauterine growth restriction. Multiple algorithms have been proposed that combine uterine artery Doppler measurements with maternal history or biochemical markers, or both, to determine the risk of early and late-onset preeclampsia and intrauterine growth restriction. One clinical review summarizes much of the literature on this (19). Although more prospective studies are needed to elucidate fully which women should be screened, which algorithm should be applied, and which intervention is best, this application of first-trimester is highly promising and is likely to increase in coming years in the United States. The purpose of this study was to determine the accuracy with which uterine Doppler in the first-trimester of pregnancy predicts preeclampsia and fetal growth restriction, particularly early-onset disease. The conclusion was first-trimester uterine artery Doppler is a useful tool for predicting early-onset preeclampsia, as well as other adverse pregnancy outcomes. Based on the number needed to treat, abnormal uterine artery Doppler in low-risk women achieves a sufficiently high performance to justify aspirin prophylaxis in those who test positive (20). For at least 20 years, many researchers have advocated the use of ultrasound in general and transvaginal ultrasound in particular to identify anomalies in the first and early second trimester. Over that period, advances in transducer technology, faster computers, and deepening understanding of developmental anatomy have facilitated such use. Increasing reliance on first-trimester screening brings more and more women with gestations from 11 to 14 weeks to the obstetrician’s office, providing an opportunity to expand the narrow viewing angle of the ultrasound probe from the nuchal area to the entire fetus. As time goes on, we may discover additional compelling reasons to shift the first fetal evaluation from the second trimester to the first. In the meantime, we find no reason not to widen the viewing angle of transducer probes to assess fetal anatomy at the first-trimester scan. First trimester screening between 11 and 14 weeks has been shown to be an effective and reliable screening test for Down syndrome and trisomy 18. In particular, cardiac anomalies, and the option of earlier diagnosis by chorionic villus sampling, if available. First trimester screening (NT, pregnancy-associated plasma protein a [PAPP-A], and HCG) is an acceptable, cost effective approach for Down syndrome risk screening for women if they present early in pregnancy (before 14 weeks’ gestation). Incorporation of nasal bone assessment into the first trimester screening protocol is optional and should be limited to clinicians who have specific training and participate in an ongoing quality assurance program. Approaches that use first-trimester screening have improved detection rates and lower false-positive rates. First trimester screening can be used in multifetal pregnancies; however, women should be made aware of the limitations of screening in this setting. An NT measurement of 3.5 or greater, even in the setting of a low-risk for aneuploidy screen result or normal fetal karyotype should prompt a detailed anatomic ultrasound, echocardiogram or both. Women who have elected to have first trimester screening and/or CVS should be offered. First-trimester screening requires adherence to strict standards and maintenance of quality, both in the laboratory and ultrasound units. Sonographers must be appropriately trained in the proper technique of NT measurement and have appropriate certification through available organizations.